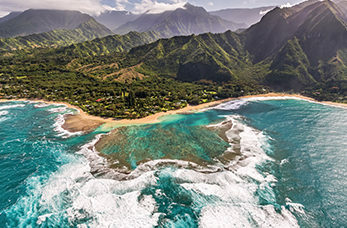 Kauai (Nawiliwili) is Hawaii's fourth largest island and is known as the "Garden Island." The island is draped in emerald valleys, sharp mountain spires and jagged cliffs aged by time and the elements. Visit one of the most stunning places in the world, with miles of coastline, lush green valleys and cascading mountain waterfalls you'll be amazed at how much beauty you can see in just one area. Known as "The Grand Canyon of the Pacific" this natural wonder provides panoramic views of stunning vistas that go on for miles. Situated atop Kilauea Point, this is one of Kauai's most visited sites for its scenic beauty. Built in 1913, it served as a pivotal navigation aid for ships sailing on the Orient run. The Napali Coast features emerald green pinnacles towering along the shoreline, this stunning setting has been the backdrop for movies such as Jurassic Park, King Kong and others.